Hello everyone! It’s been a while since our last giveaway so here we are again with an awesome chance for all our readers to win a free meal with EatNow vouchers. Eatnow.com.au, a nationwide online food delivery service is offering you a chance to win a $50 voucher, we have two of these to giveaway so read on to see how you can score yourself one. EatNow.com.au provides you with a quick and easy way to order food online from a network of restaurants all across Australia. EatNow.com.au was founded in 2010 by a few hungry Australians, with help from their mum, and has recently joined The Catch Group, Australia’s #1 eCommerce company. Our goal is to make it quick and easy to find great local restaurants that service your suburb. Sit back and wait for the food to be delivered. It’s too easy! With EatNow.com.au you can order food from your mobile, tablet or PC without ever leaving the couch. Using the previous order function, ordering your favourite meal has never been so easy. We are an Australian owned and operated business that aims to provide excellent coverage Australian wide. We have 3,000+ restaurants listed and are constantly on the lookout for new restaurants, if you can’t find your favourite restaurant, use the suggest a restaurant page to let us know. 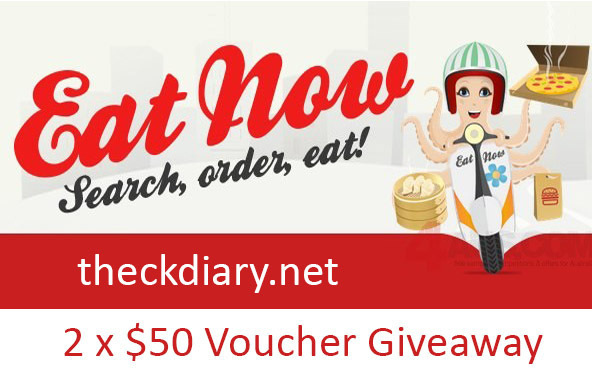 There are 2 x EatNow vouchers worth $50 each up for grabs which will go to two lucky winners. Good luck to everyone who enters and don’t forget to like our facebook page or Instagram (@fooddiarybyck) for all post updates and any future giveaways that we run! How to enter: Leave a comment about what your favourite local restaurant is and why. Like our Instagram or Facebook for an extra chance to win (max 3), make sure you let us know who you are! Closing Date: Sunday 10th August @ 9pm. We will require a response from you within 48 hours. Red Lounge Cafe in Ivanhoe. Cute little cafe/restaurant that serves delicious homemade and traditional Chinese dumplings, noodles and snacks. We love Indian Home Diner at Summer Hill in Sydney’s inner west for reliable, delicious and cheap Indian takeaway! I like you on FB (Charlotte Scotton) and Instagram (@allaglow). Thanks for the chance, fingers crossed! Jobes Pizza , Gnocci Three times the avergae size of normal add jalepena cream cheese and your’e almost there. The Pickled Fig as it has tasty food and a great beachfront location perfect for watching the sunset over the ocean. Minna House in Hawthorn is my favourite Japanese restaurant. Delicious!